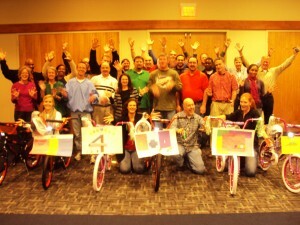 Nearly 30 employees of HealthSouth Print Solutions came together for a Build-A-Bike Team Building Event in Birmingham, Alabama, that resulted in a lot of fun, laughs, learning, and 6 new bicycles being given children from the local Birmingham Boys and Girls Club. 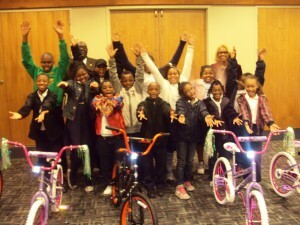 The event had significant impact on the participants as well as the children that received the bikes. The team building event was a memorable end to a day of meetings and goal setting. It provided some activity as well as opportunities to explore team building in a fun way that stretched the individuals and their teams. There was a lot of laughter, a lot of questions, and a lot of learning. Learning can be a difficult task, but people seem to retain and learn best when they are enjoying the activity. This is the basis for the Build-A-Bike Team Building Event. It joins together excellent learning opportunities with the ability to have fun and enjoy one another’s company. HealthSouth Print Solutions expressed a great delight in the program and the significant opportunity to give back to the community as well as explore team building in a fresh way. The activities each had a common purpose but allowed for and demanded individual contributions. That is what team work is all about. Each team participated well. In fact, the program works because each individual contributes to the smaller group they are in, and each group contributes to the overall program. By the end of the program it is realized that although in several different groups, there is only one team. Thanks to HealthSouth Print Solutions for a great program and a great way to give back to the Birmingham Community. Six children, their families and the communities they live in shared with you in a great Build-A-Bike Team Building Event. You make a positive difference. teaches team building events for us in the MidWest and South including Birmingham Team Building Events and team events in Atlanta, Georgia.